"Whipped up this low fat number while on a diet/workout program. GREAT beef meatloaf substitute. 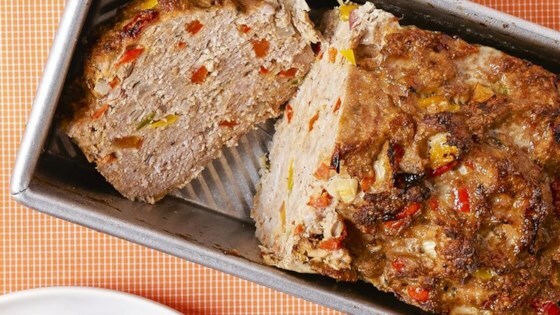 My husband, the meatloaf lover, just LOVES this loaf and it is SO easy to mix up, freeze and bake later for a quick meal!" In a large bowl combine the turkey, egg, salsa, red bell pepper, yellow bell pepper, onion, bread crumbs and lemon pepper. Mix well with hands until blended. Roll into a small loaf and place on a foil-lined baking sheet. So easy to make and has a great mildly spicy flavor. You must double the recipe to fit a regular loaf pan and double the cooking time at 375 degrees. Pretty good, but had to cook longer, like 40 minutes instead. Tried a 2nd one with some light bbq sauce poured across a "ditch" on the top... and wow.. that was good. I love this meatloaf. I used 1 lb of turkey so I doubled the ingredients. It was a little too runny, so I added more bread crumbs and baked for 45-1 hour. It was wonderful.